Techie Mum: Something you may already have and don't know it! Something you may already have and don't know it! During a course I was teaching on Monday one of the students had some questions about Microsoft Office 2010 and he’d brought the box of software with him. After answering his questions the class had a chat about Microsoft Office and what each individual program could be used for. Whenever I do this, one thing amazes me – no one ever sees the words OneNote on the Microsoft Office box. Everyone knows Word, Excel, PowerPoint and Outlook, but OneNote is ignored. If you have any version of Microsoft Office from 2003 on, you have OneNote. So, what is OneNote? OneNote is a brilliant organising and note taking program. Think of it like a binder with dividers for different sections, where you can store all your notes within each section. In OneNote you create notebooks, and within each notebook you can have tabbed sections. Within each section you have an unlimited amount of pages you can add. · Copy and paste web content onto a page – either a link to a webpage, or copy and paste the entire page. If you copy and paste an article from the web, OneNote automatically adds the original link. · Record video, using your computer’s webcam. This automatically adds the video to your notebook page. · Add pictures, maps, screen clips, tables. You can tag anything you add to OneNote to make it easier to find if you need to search for it later. Notebooks can be shared too, so that if you are collaborating with a team on a project, each member can add to the notebooks you are all working on and each members’ notebook will be automatically updated and you’ll be able to see when changes have been made. There’s also templates you can use for particular tasks to save you setting it up yourself – for example, there’s a Home Improvement Journal, Wedding planner notebook, and a Meeting manager template. 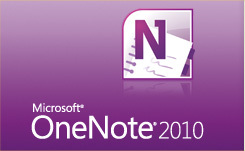 I use OneNote when I’m planning a new training course. I create a notebook for the course, then add a tabbed section for each session of the course. Within each of these tabbed sections I have a page for the course handouts I create for that session. I just insert my Word files onto that page and they’re all in the one place. I also have a page for research where I can add anything I find that helps me to plan the course – videos from YouTube and articles from the web. In the past I used to have videos added to my YouTube channel, favourites in my browser – stuff all over the place. It is so much easier having everything in the one place. Another great feature is that you never have to ‘Save’ in OneNote; everything is automatically saved for you. Like I said at the beginning, OneNote comes with all versions of Microsoft Office, but it’s also available as a free app for your Android phone or tablet, iPhone and iPad (you can even write on the screen in OneNote if you’re using a tablet). So, as well as being able to share OneNote notebooks with others, you can share them with yourself and they’ll be synced across your computer, laptop, iPad and phone, and there’s a web version too. Now go and have a look on your computer and see if OneNote is there.